When Nokia announced the N9 last month, they claimed it to be the fastest cameraphone on the market. But before Nokia came up with the N9, HTC had already called dibs on that title for their Sensation. Also, when Nokia did the cameraphone time comparison, they seemed to have left out the Sensation for some reason, so we never really found out which one is faster. Until now. 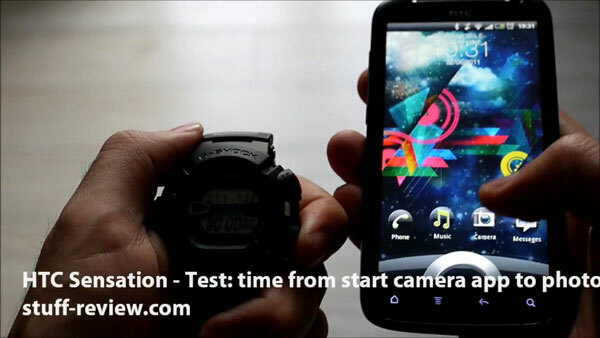 The guys over at stuff-review.com decided it was time to settle the matter once and for all so they took out their trusty stopwatch and timed the HTC Sensation to see how it compares with the figures of the N9 that Nokia published and guess what, the Sensation won. Stuff-review.com timed two instances, one where they started the camera from the lockscreen using the new shortcut function in Sense 3.0 and then once again using a shortcut from the regular homescreen. In both the cases the Sensation turned out to be faster than the N9, with a time of 2.39 seconds in the first test and 2.21 in the second case. Due to human error, these figures are actually slightly higher than what the Sensation is capable of but in either case it still turned out to be faster than the N9 which does the same in 2.6 seconds. You can check out the phone in action in the video below and in case you manage to get a lower time on your Sensation, do let us know. Update: After watching the video a couple of times it has come to my attention that the person in the video did not allow the Sensation camera to focus at all. The shutter button was pressed immediately after the camera was started. Usually when the camera has focused you would see a green square on the screen, as you can towards the end of the video. If you just press the shutter before it focuses in real life then you will get a quick but blurry picture. So clearly, Nokia did not skimp on the focusing bit in their tests. As such, the jury is still out on which is the fastest camera phone out there and I guess we will have to do some testing of our own to come up with the answer.